As I mentioned yesterday, there are two kinds of solo rules for DZ. 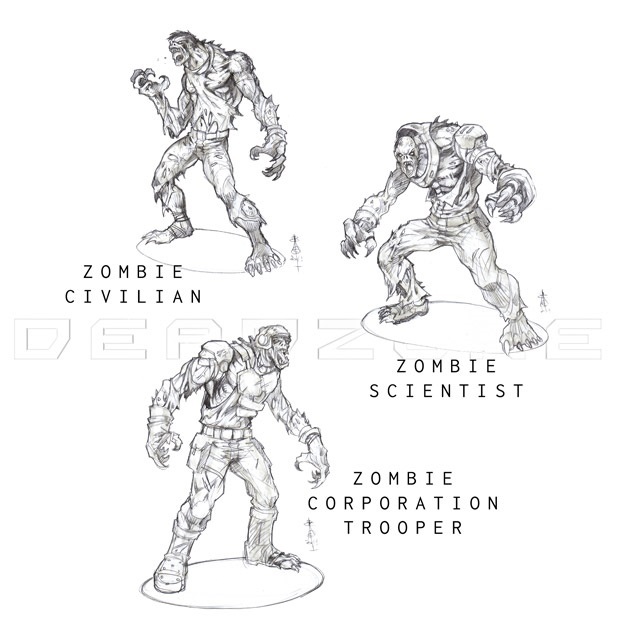 The first ones are the involved and complex (in design terms) ones; the second are full of zombies. The idea of a solo campaign where you play against the zombies harks back to such oldies as Chainsaw Warrior in feel. It’s something to amuse yourself with for an evening’s gaming. In some ways it’s a guilty pleasure: not having to socialise, not needing to share the snacks, not needing to hold back in your merciless massacring of the foe. It’s a good job that AI doesn’t get upset. I thought that this would work best as a mini-campiagn rather than a one-off for a couple of reasons. Firstly, I like campaigns. They allow me to tell a story and develop a plot, however crude, over a few battles. I like telling stories. Secondly, this is a far more immersive format than a one-off game. When you’re telling a story you start to care about your models in a more personal and individual way. When they narrowly survive from one battle to the next and then have to risk their (plastic) necks once more you are drawn in far more than when playing with soldiers who have no history. It’s all the same things that make normal campaigns work, but it’s slightly different because you’re on your own and the whole thing is in your head (rather than being a shared gestalt). That allows you to sink into it even more and makes this game format a unique experience. Of course, the moment I mentioned this in public, someone asked for multi-player solo rules. When I’d stopped giggling at the oxymoron I thought about that and I don’t see why you couldn’t play co-operatively against the horde (which I assume is what they meant). As my post on game modes explains, whilst it’s easier for me to think of them separately, most modes can be combined without much fuss (making DZ even more flexible). This entry was posted in Deadzone, Game Design Theory. Bookmark the permalink. Whilst the zombies mode will be a campaign, will one of the missions in this campaign be a straight up fight? So that if I just felt like having a knock ’em down zombie slaying massacre I could just go straight to that scenario? Also, is this campaign prescriptive in terms of what forces to use? Or can it be any faction just with a certain points allotment? 3-4 player co-op zombie survival, each player plays one mercenary! Awesome idea bro!, i really hope mantic considers it. Jake, will solo play vs zombies involve the AI cards? No. AI = Artificial Inteligence and that doesn’t suit zombies at all. I may need to buy more zombies…. The co-op idea is great if you could either codify it or put in some idea seeds you may have as to how to do it (while possibly adding some fun competitive elements). Also will there be scalability for large map zombie runs? Is that 3-4 dozen zombies on a 2’x2′ map? It’s a target rich environment.